So. Once In a Blue Moon had Michael in a dress. See? Michael in a dress. Nobody was dressed at all in Twice In a Blue Moon so I won't go there. The first manip is crappy. She looks like she's doing a cameo in Zorro, head is wrong - no comment, please - hair is wrong, make-up is wrong... Weird hand on hip is not my fault: weird hand was initially weird. This is what you get for using fashion pics, I guess. The second one... thank you, Marlene Dietrich. The second one invalidates the fic: why the hell would the boys want to get her out that suit instead of just... watching?! 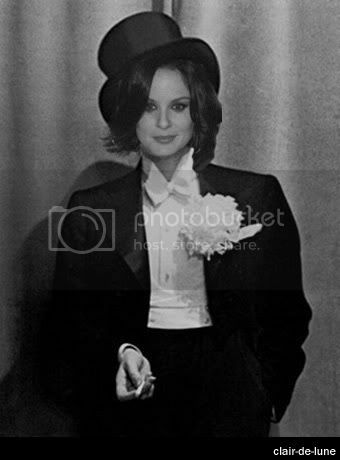 By the way, not that easy to find a "woman in tux" in Google Images. I mean a real tux, not a white one - this isn't The Love Boat - or one without a shirt. I wanted a tux for Sara, not for Lincoln - I needed the shirt and its buttons! I have to agree with you that #2 is easily better than the first one. Marlene Dietrich had real style because she didn't look like a fashion model dressed in a tux and Sara carries that off here too! It's really, really good! Maybe it was just watching that made the boys want to get her out of that tux?!! I know one thing! Keep on Photoshopping because you're getting better!! Next stop? Michael in long black gloves!! I think you did a fabulous job and I love it! And maybe the fact that Michael knew what she was wearing beneath the tux? To be obnoxiously honest, I'm quite happy with myself for the B & W manip :-p There certainly are flaws, but I'm too busy finding it - and her - pretty to note them for now. It doesn't exactly matches the description I made in the fic, but the idea is here. You know how it is... most of the time you flip backwards through your friendslist. Which is why I saw your *Sigh* entry with Pix #2 before this one. And in my mind I already had formed the question: Who on earth is that gorgeous Lady and Why on earth does she look so familiar? Now I know she looked double-familiar! And I didn't even realise it wasn't real! Didn't know you were into manips also, but honestly, the b/w Marlene/Sara is perfect! I used to play a bit with Paint Shop Pro and make fanarts or icons, but they were rather meh. Sara-Marlene is "perfect" because it was an easy manip. That said, I'm quite happy with myself about it :-p And did I mention how pretty she is like that?